The survey indicated that while the majority of staff feel proud to work for the University, communication with senior management remains a problem. A recent survey carried out by the University gathered feedback on staff satisfaction. Nearly 70% of the University’s staff completed the survey, giving an accurate representation of satisfaction across the board. The outcome of the survey will be used to further improve the University’s actions and will form part of their action plan. The overall response was mainly positive, with many staff feeling proud to work for the University. The majority of staff feel like they are trusted to do their jobs well, and are willing to perform extra duties to help out other members of staff. However, an issue highlighted by many members of staff was a lack of communication with senior management. This communication issue stemmed from a perceived lack of visibility and engagement from the Senior Management Group (SMG). Overall, staff were dissatisfied with the level of engagement they received, with many staff believing that the SMG do not listen to staff’s views. Staff satisfaction also rated low with regard to the ability to provide feedback up the University hierarchy. This paired with the SMG’s lack of visibility seems to suggest that the issue of communication requires immediate attention. In addition to this, figures concerning members of staff who stated that they were a victim of discrimination or bullying and took no further action were surprisingly high. It is unclear, however, whether this is a direct result of communication issues. SMG have since endorsed a wider programme of activity to consider new ways of supporting staff to input their views and continue the conversation beyond the survey. 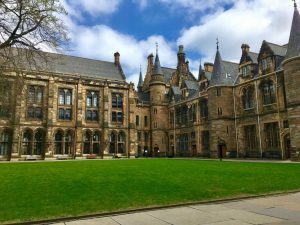 This work will be led by a new Engagement Steering Group, a group of academics and members of professional services, including HR, Communications and World Changing Glasgow. Muscatelli indicated that the internal issues the survey revealed will receive particular attention over the next couple of months, and will contribute to the University’s ongoing improvement.